Well, we're back in Tennessee! We left late last night in some serious thunderstorms, and now we're at my parent's house south of Nashville. We can't get into the city because of flooding, but thankfully we're safe right outside of it. We'll be driving back home in the morning. And now for a slightly late Sewing Saturday. 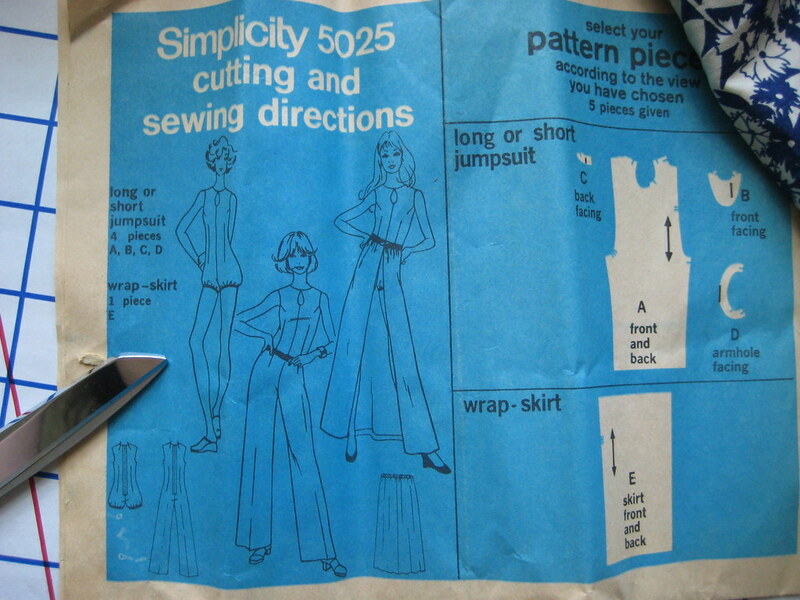 I've started another project.. a vintage romper pattern from the 70's! I'm making the short romper to the left with elastic at the leg openings. 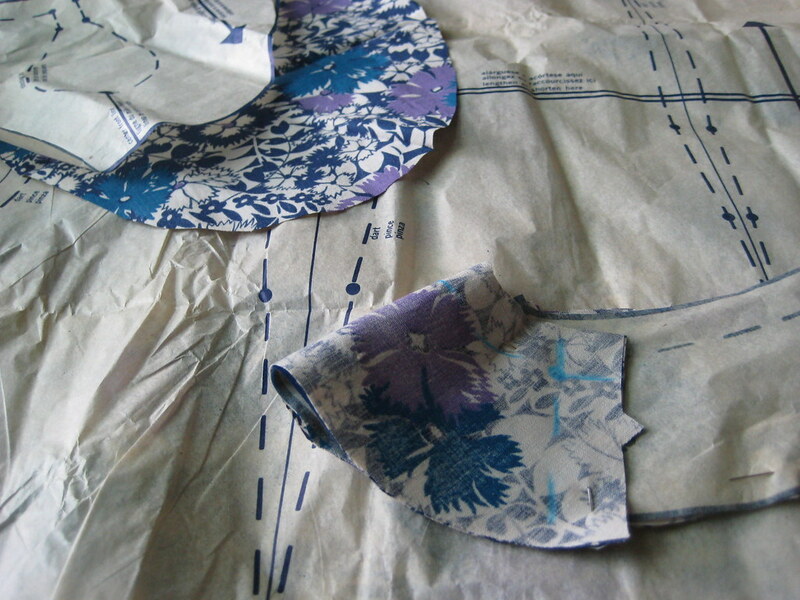 Once I chose which floral fabric to use, I cut out the pattern pieces. I chose the blue and purple floral fabric that I found when I bought the large amount of vintage from a woman outside of Nashville earlier this year. The fabric feels similar to the broadcloth I used in my first project, but a little lighter, makes it a good summer outfit with some black tights and the strappy black sandals I just bought. I folded the fabric, right sides together, and pinned the pieces to the fabric. 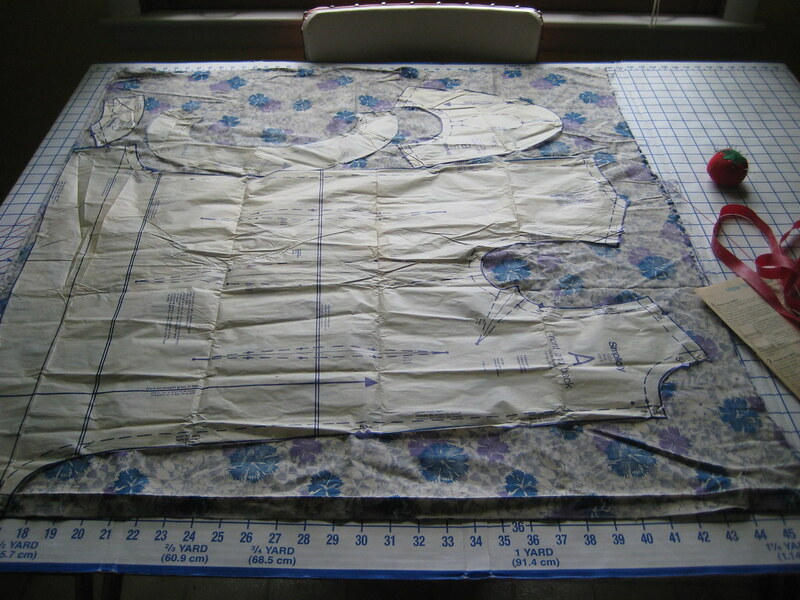 I cut the pieces out, then colored in the seam allowances and other markings on the back side of the fabric according to the directions on the pattern pieces. It feels great to have the most time-consuming and least creative parts (cutting and marking. no fun) finished. I can't wait to actually sew the romper! Our trip to Illinois was exactly what I wanted it to be. We ate out, stayed up late with friends, and drank good coffee. I even had a chance to hit up a local thrift store and found it filled with so much goodness that I stayed for almost two hours. 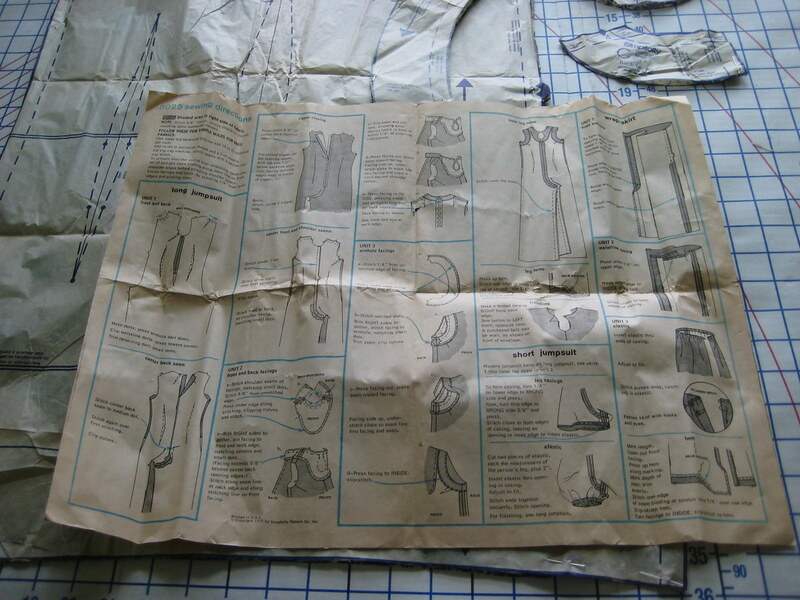 I bought a bunch of sewing patterns, fabric, buttons, and clothes for the shop. 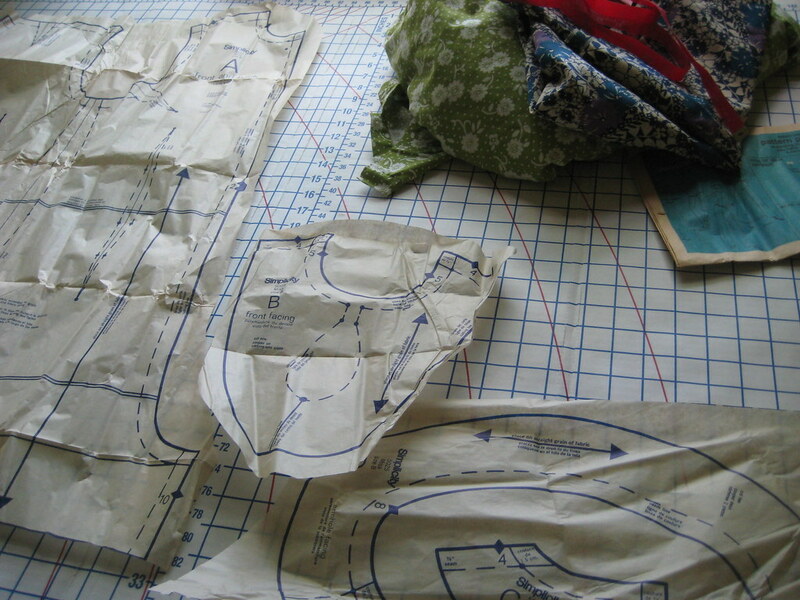 The patterns are all old and lovely (and they cost me a quarter a piece!) - I only bought 8 or 9, which was a feat, considering they had well over 100. Some included iron-on transfers with funny 70's style birds and flowers, others had applique cut-outs with instructions. My favorite find had to be the vintage fabric. 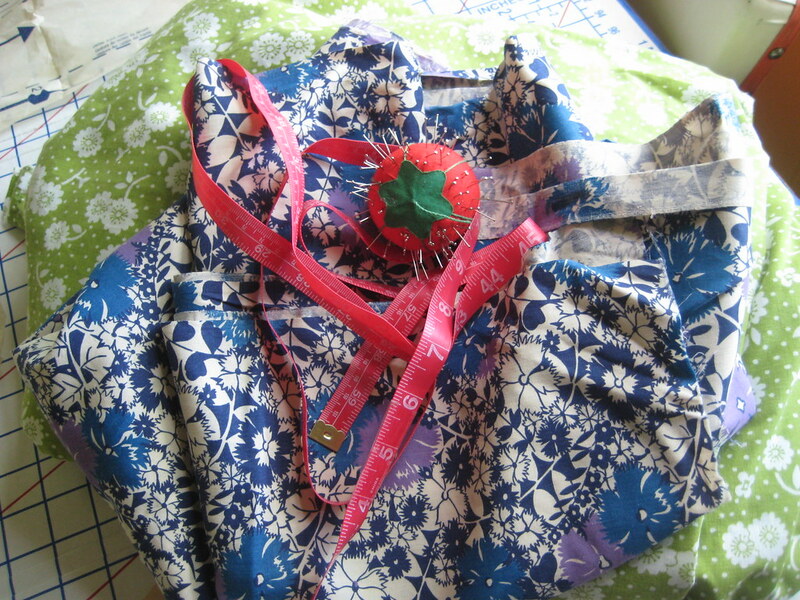 I have a bunch of liberty print and summery gingham to work with now, not to mention a sturdy patchwork fabric that my mom says I should make into a tablecloth. I'll be posting photos later this week! surprise etsy may day sale.. everything is half off!